While the stars have relatively fixed positions in the night sky, the planets do not and the word planet comes from the ancient Greek for wanderer. The planets will all be in the sky at some time, but there may be lengthy periods where some are only in the sky in daylight (and hence invisible) or at inconvenient times of the night. In any case, until you get more familiar with their appearance you will have to access some current information to identify them. Newspapers with detailed weather forecasts will show what time each of the planets rise from the eastern horizon—and remember it will take around six more hours to get from the horizon to an overhead position. Otherwise, you can find where they are in real time with an on-line sky chart—like the one at Heavens Above—or with planetarium software, like Stellarium. 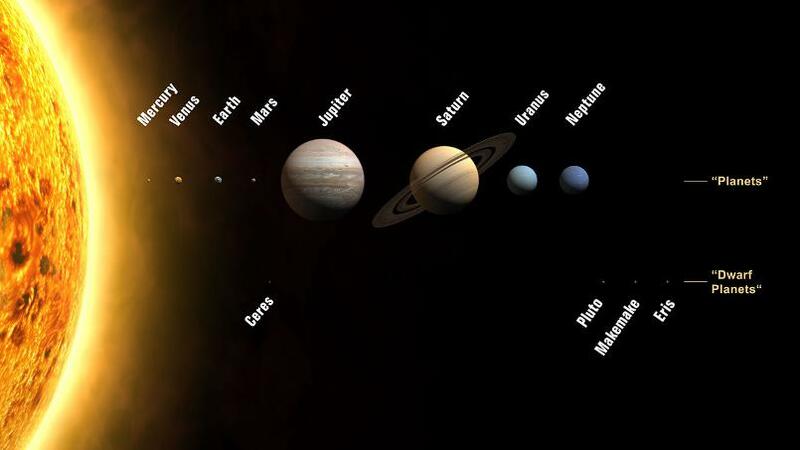 The planets all move along a narrow path close to the ecliptic, which is the line the sun travels along in the day. When you are looking at the ecliptic you are really looking through the flat disk shape of the solar system, so all the planets are all more or less on that line–as is the Moon. If it’s really bright and in the east before sunrise – or in the west after sunset—it’s almost certainly Venus. If it’s almost as bright and somewhere else, it’s probably Jupiter. Mercury sticks close to the Sun, like Venus, and is often seen above or below Venus if it can be seen at all. Other times though it might be just ahead of the Sun before dawn, while Venus is behind the Sun at dusk—or vice versa of course. Mars, Jupiter and Saturn are less wedded to the Sun’s apparent motion and may be visible at any time of night. Mars is a bit red and Saturn is reputedly yellowish, but both could be easily mistaken for stars by a casual observer. Jupiter is a more obvious bright, white object that generally doesn’t twinkle, unlike the stars and dimmer planets. Uranus and Neptune can’t be seen with the naked eye and are very difficult to find or distinguish from other stars, even with a cheap telescope. Your best bet would be to try it with binoculars and a star chart if you are keen. However, this sounds too much like hard work for Cheap Astronomy. An important thing to remember is that all the planets, including the relatively invisible Uranus and Neptune, move along the ecliptic. So, at least for southern sky observers, any bright star-like object way over in the southern part of the sky is just a star. The line of the ecliptic runs roughly east to west and is mostly in the northern part of the sky. That’s the only place you will find the planets. Apart, of course, from dwarf planets and extrasolar planets, which no Cheap Astronomer will have much chance of seeing. The seven days of the week are traditionally named after the seven celestial bodies that are visible to the naked eye—and in obvious motion against the backdrop of stars. In English, only Saturday (Saturn), Sunday (Sun) and Monday (Moon) remain, the rest of the days having been renamed after some has-been Norse gods. However, the planetary names persist in ‘Latin’ languages such as Spanish. In this language, Tuesday is Martes (Mars), Wednesday is Miercoles (Mercury), Thursday is Jueves (Jupiter) and Friday is Viernes (Venus).